The Companions offer holy fellowship and presence to the most marginalized in the LGTBQIA community, remaining present for celebrations, vigils, in bars and on the streets to engage as family with those in the queer community who are vulnerable. They are actively involved in the Imperial and Ducal Courts of San Francisco, as well as helping to raise money for a variety of non-profit organizations that serve the LGBTQIA community. On the second Monday of each month, the Companions offer table fellowship for local LGBTQIA activists and community members, discussing a variety of topics relevant to the community. From spirituality to activism, grassroots organizing to emotional support, the Companions offer community to those in need of refreshment and creativity to continue the work of advocacy. We meet at Cafe Flore at 2298 Market Street (corner of Noe). Please join us! From 6pm to 10pm each night, the Companions staff a hotline for those who need an ear and support. Aunt Dorothy is available to counsel, listen, and love those who find themselves alone. You can find out how to contact us using the Contact link above. 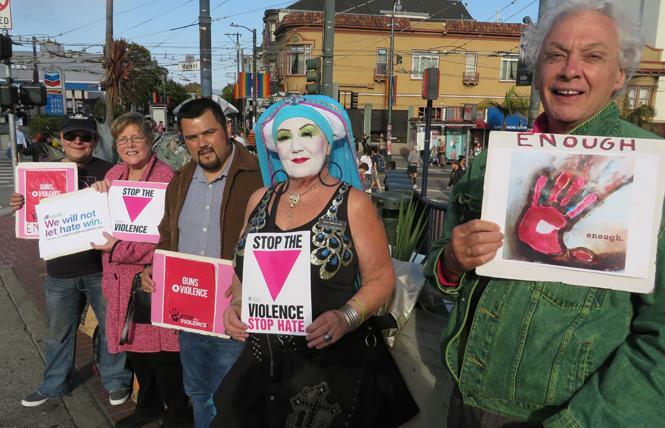 Every Friday, from 6pm to 7pm, the Companions bear witness against violence against the LGTBQIA community by standing Vigil at the corner of Market and Castro Streets in San Francisco, against whatever weather conditions may arise, until violence and anti-LGBT legislation come to an end. Come and join us! The Companions, in their unique way, and with the support and presence of other LGBT organization in San Francisco, celebrate Good Friday, Ash Wednesday, Pride, Easter, and other holy days by reclaiming space against violence, adapting the rituals of the Church to invite those who have been cast out to know they are welcomed back as beloved children. Saint Francis' Day is particularly important as the Companions bless animal (and human) companions for the local community, bringing blessing and joy to all manner of companionship.